If you are not playing in, bringing your child to play in or coming to watch the 1/24 or 1/31 tournaments, you will be required to go through the screening on your next visit to the club. 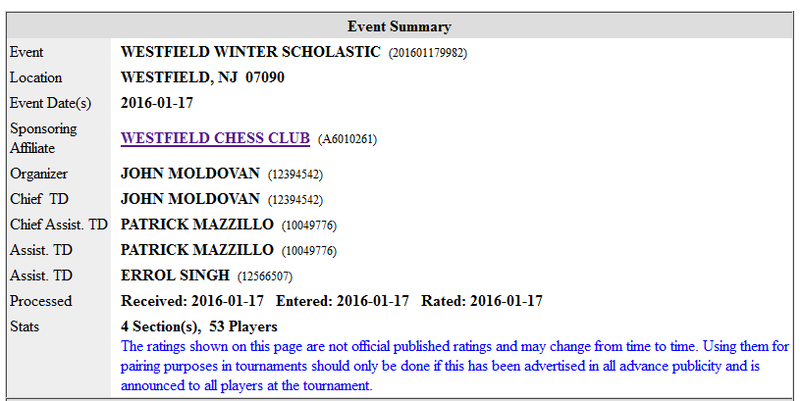 and apologies to Assistant TD Ramneek Singh, who we neglected to fully credit in our USCF report. We will correct the error. Finally... a reminder: Our next Scholastic event will be on April 17th, 2016. 1st thru 5th place, from L-R: Sriram Kumar (1st place), Aayush Ajith (2nd), Jack Silver (3rd) and Albert Tang (4th). Not pictured: Steven Feng (5th). Honorable Mention, from L-R: Alec Touhey, Andy Xin and Baron Wu. Not pictured: Eric Li and Anthony Tang. From L-R: Alan Weintraub (3rd place), Mythrea Dharani (2nd), Benjamin Kamen (1st), Rohan Narayanan (4th) and Aiden Lu (5th). From L-R: Anish Reemala (5th place), Benjamin Liang (4th), Vishak Mahesh (3rd), Alan Hu (2nd) and Daniel Klymchuk (1st). Sriram Kumar (1771), Benjamin Kamen (1174) and Daniel Klymchuk (529) were section winners in yesterday's Westfield Winter Scholastic, which featured 49 participants. 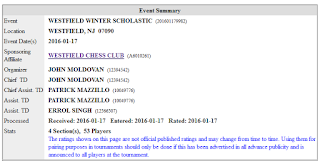 On Sunday afternoon (Jan. 17), the Westfield Chess Club will be running its Winter Scholastic tournament. If your child needs to join the USCF, please sign him up today, tomorrow or arrive early (before 1:30).